Depending on how your house is laid out, you might have a corner breakfast nook. In other words, the breakfast nook is situated in the corner of your home where two walls are outside walls. The alternative is a breakfast nook that extends from the kitchen where the kitchen is in the middle of the house. In this case, only one wall or perhaps no walls of the breakfast nook are outside walls. However, there might be other walls encasing the breakfast nook on the other two sides, not leading to the kitchen. In this case, you could also consider your breakfast nook a corner breakfast nook because you can still utilize corner furniture sets. Another alternative is where you build the breakfast nook out slightly farther than the rest of the house so that three walls, if it is square, or more walls, if it is some other shape are outside walls. With this alternative arrangement, the only option for breakfast nook furniture is a table that sits in the middle of the space. On the other hand, if you have a corner breakfast nook, then your breakfast nooks set options expand. You could put a table in the middle of the room; or you could use a corner breakfast nook set. The advantage of a corner breakfast nook set is that you will be able to use a larger table than if you placed on in the center of the room. When a table is in the middle of the room, you need to leave about three feet of space on every side so that there is room to pull chairs out. However, if you purchase a corner table with benches, there will only be about eighteen inches between the wall and the table on two sides. That gives you an additional eighteen inches of table space in both directions. One factor to consider if you want to get a corner breakfast nook furniture set is the fact that at least some of the seating will be benches. If you have a large family and need lots of seating, that could be an advantage. Kids do not mind sliding in and out of booths and it is easy for them. You can fit more people on a booth that you could in chairs in the same amount on space. On the other hand, if you are going to be asking guests to sit at your kitchen table, then benches might not be the best choice for you. Some people are uncomfortable sitting as close to other people as you have to when sitting on a bench. In addition, some people have a hard time sliding in and out of a bench. Another factor to consider is the two outside walls and whether or not there are windows there. If your breakfast nook literally is in the corner of your home, then there will probably be windows on those two outside walls. If the kitchen furniture that you choose has high backs on the corner benches, they could block the windows. IF you have windows on the two walls where you will be utilizing the corner for furniture, make sure that the seating arrangements do not come up high enough to block the windows. In addition, you will need to make sure that the window treatments do not interfere with the seating arrangements. You do not want long drapes that fall onto the bench seats. 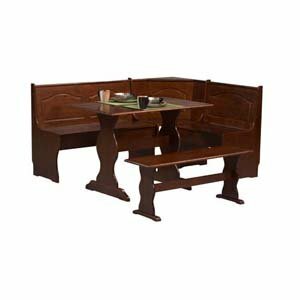 If there are no windows, then you have a lot more flexibility when choosing your corner breakfast nook furniture for sale. Chelsea Walnut Break Nook Set creates a cozy spot for meals and conversation in any corner of the kitchen. The rich walnut finish on this corner nook provides a traditional look to this highly functional piece. The nook corner bench and nook free-standing bench seats five people comfortably. You can determine the direction of the corner unit during nook assembly. Some assembly required.